When I moved to Seattle from New York City, I immediately noticed an important cultural difference. Where on the East Coast I was accustomed to white bakery boxes tied with red and white string, in Seattle it seemed that the norm was pink bakery boxes. 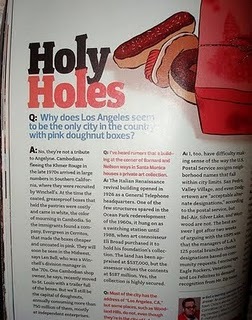 Delving a bit further, I learned that the pink box does indeed reign in other areas of the country too. When I asked a baker why she used the pink boxes instead of white, the answer was pretty straightforward: "they're cheaper". No, they’re not a tribute to Angelyne. Cambodians fleeing the Khmer Rouge in the late 1970s arrived in large numbers in Southern California, where they were recruited by Win-chell’s. At the time the coated, greaseproof boxes that held the pastries were costly and came in white, the color of mourning in Cambodia. So the immigrants found a company, Evergreen in Cerritos, that made the boxes cheaper and uncoated in pink. Though this response is specific to the California area, I believe it may shed some light on the boxes in other areas of the country too. Obviously, not all bakers would even be aware of white being the color of mourning in Cambodia--but I would surmise that the cheaper cost of the uncoated boxes would speak to many bakers looking at the bottom line. Why pink though? Well, alas I can't shed any more light on that other than my own theory, which is that it's a forgiving color when it comes to grease stains: slight darkened areas of grease which might seep through the box look much more subtle on the pink color than on a white box, where they show up in an unappetizing shade of grey. 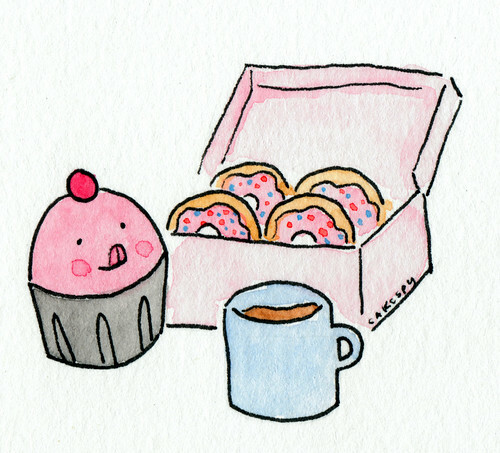 Of course, the one thing that holds true regardless of whether the parcel is pink, white, brown, or even some other color is that it's always a beautiful sight to see a bakery box coming your way. Read the full "Ask Chris" feature here.